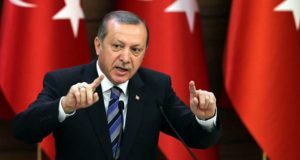 Following a coup attempt in July that some analysts said appeared to have been “orchestrated,” Turkey’s ruling Justice and Development Party (AKP) has submitted constitutional changes to parliament that would significantly expand the powers of President Recep Tayyip Erdogan. The AKP’s proposal received 316 supporting signatures from the 550-seat assembly. If cleared by a constitutional committee and approved by parliament, the reforms would pave the way for a referendum on granting Erdogan full executive powers and, critics say, allow him to rule unchecked. Related: Time for NATO to wake up and smell the coffee; Moscow was the winner in coup drama, July 24, 2016. The constitutional changes pushed by the AKP would allow the president to appoint the government, retain ties with his party, propose budgets and declare states of emergency. The amendments were proposed by the AKP with agreement from the Nationalist Movement Party (MHP). The bill, according to media reports, proposes a local election for March 2019, a presidential election and a general election for November 2019, and concentrated executive powers in the hands of the president. Meanwhile, Kurdish militants have claimed responsibility for a Dec. 10 terror attack at a football stadium in Istanbul which killed at least 38 people and wounded 160 others. At least 13 people have been arrested over the twin bombing which was carried out by militant group TAK, also known as the Kurdistan Freedom Falcons. Officials confirmed 30 police officers, seven civilians and an unidentified person were killed.